Treating men as a culturally distinct group, Rich Furman integrates key conceptions of masculinity into culturally sensitive social work practice with men. Focusing on veterans, displaced workers, substance abusers, mental health consumers, and other groups that may be unlikely to seek help, Furman explores the psychosocial development of men, along with the globalization of men’s lives, alternative conceptions of masculinity, and special dynamics within male relationships. Furman supports his conclusion with case studies and evidence-based interventions. His research merges four social work theories and explores how they inform practice with mental health issues, compulsive disorders, addiction, and violence. By promoting gender equity and culturally competent practice with men, Furman bridge the gap between clinical and macro practice. 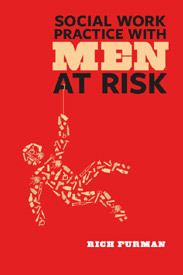 Social Work Practice With Men at Risk is for educators and practitioners hoping to pursue effective, far-reaching interventions.